I present to you: my revelatory recipe of the year. I’ve been addicted to Korean spicy sauce ever since I tasted my first bibimbap on Korean Air 10 years ago (YES, I’ve had life-changing food on an airplane!). So much so that, after we went through the bottles of sauce we brought back from South Korea, I spent a fortune in duty fees to import some from the U.S.—back then it was impossible to find it anywhere near home, not even in an online Canadian store. The sauce I buy is known as a hot sauce for cold noodles or bibimbap, and is a blend of hot peppers, tomatoes, garlic, sesame oil, vinegar, and sugar. It’s spicy, slightly sweet, and tangy. It’s basically gochujang, the tasty Korean fermented chili paste, turned into an addictive sauce sold in a squeeze bottle. I pour it on anything and everything, just like other people do with ketchup or sriracha. The reason I’m babbling about Korean spicy sauce is that I’ve recently used it in a new recipe, which was mind-blowing in the same way my first bowl of bibimbap was. 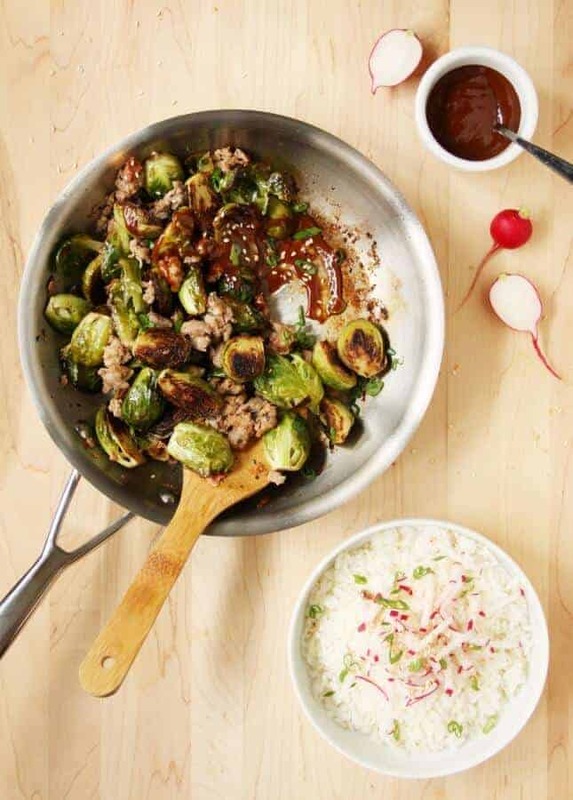 On the face of it, it’s quite simple: roasted Brussels sprouts and fried sausage doused in a spicy sauce and served over rice. But the flavors, oh, the flavors of that sauce! The sesame paste and soy sauce are such an obvious match to the Korean spicy sauce I should’ve thought of it myself. It creates a versatile dressing that would be just as delicious over a cold noodle salad as it is in this comforting dish. A word about the ingredients used in the dressing: The bibimbap hot sauce brand I usually buy is Ottogi, but I just discovered the Seriously Korean Bibim Gochujang sauce and it’s delicious. If you can’t find it, you can substitute gochujang, which is somewhat easier to find in Asian supermarkets (or online). I’m also using Chinese sesame paste, which is similar to tahini, with the difference that it’s made with toasted rather than raw sesame seeds. It’s readily available in Asian supermarkets, but if you can’t find it, feel free to use regular tahini instead. In a large non-stick, ovenproof skillet, pour 2 tbsp (30 ml) oil, using a spatula to coat the entire bottom of the skillet. Set over medium heat. When the oil is shimmering, add all the Brussels sprouts halves, cut side down, setting them very close to one another so they all fit into the skillet (if your skillet isn’t large enough, you’ll have to cook the sprouts in two batches). Sprinkle with the salt and cook, without stirring or turning the sprouts, for 5 to 7 minutes, or until the bottoms are nicely browned. Stir the sprouts (it’s ok if some are cut side down, others cut side up), and combine all seared sprouts into one skillet if you cooked them in batches. Set the skillet on the middle rack in the oven and roast for 15 minutes, until cooked through. While the sprouts are roasting, whisk all the sauce ingredients together in a small bowl (you might have to warm the sauce a bit so the tahini and honey blend in). Set aside. Place another skillet over medium-high heat, add the remaining 1 tbsp (15 ml) oil, and sauté the sausage meat, breaking it up with a wooden spoon, until browned and cooked through. Remove from the heat and keep warm. When the sprouts are done, transfer them to the skillet containing the sautéed sausage. Pour the spicy sauce all over, stir to coat the sprouts all over. Serve over sticky rice, topped with radish, green onions, and toasted sesame seeds. 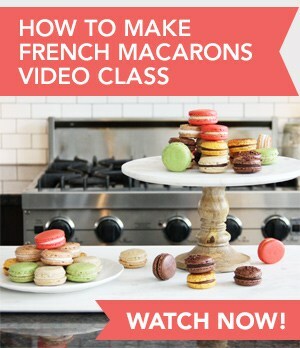 Recipe Credit: Adapted from a recipe by Molly Yeh. Hi Marie! This looks delicious! I’m not sure why the description for Hot Sauce for Cold Noodle/Bibimbap on the Koamart website says it contains tomatoes, but these Korean hot sauces usually do not contain any tomatoes. I’ve looked up the ingredient list online and the Korean version doesn’t say anything about tomatoes either. Anyway, I just wanted to add that there are mainly two types of gochujang: gochujang, which is the fermented pepper paste itself, and then there is cho-gochujang, which literally means “vinegar gochujang.” The latter can be made by adding some vinegar and sugar to gochujang.The hot sauce that you bought and used here for your recipes (both Ottogi and Seriously Bibim sauce) are “cho-gochujang,” because they contain sugar and vinegar in addition to the plain, traditional gochujang paste. Koreans tend to distinguish these two because the uses for the two types are different: gochujang is usually mixed with other sauces and condiments for heavier meat dishes, stews, and rice dishes (bibimbap, for instance). Cho-gochujang, because of its lighter and sweeter flavor, is usually used for salads and cold noodle dishes. Hi there! Thanks so much for this very useful additional information. Many Korean sauces are difficult to decipher, because of the untranslated labels! I had figured out that the sauce I buy isn’t pure gochujang paste, but I didn’t know its name. I’ll make a note of it!